New York City's famous for being a rich man's playground and we couldn't have found a home that takes this idea more seriously than this East Village penthouse -- with a built-in slide. Unsurprisingly, the silver, 18-foot-tall sculptural slide pretty much smacks you in the face as soon as you walk in. Unlike other luxury features, its presence tends to dominate the penthouse (the rest of which is actually incredibly sleek, sophisticated and somewhat minimalist). But the faster you get over the initial shock of seeing a slide built inside someone's apartment, the faster you can hop right on it -- and naturally, we did. Our entire crew. Multiple times. In case you were wondering, the owner of the now-infamous "slide penthouse" is Phil Galfond, a professional poker player who's only 26 years old! Slide aside, Galfond has also decked out his pad with some truly amazing, one-of-a-kind pieces ($35,000 glass pool table, anyone?). Like what you see? Elizabeth Kee and Lindsee Silverstein of CORE Group NYC have the listing. 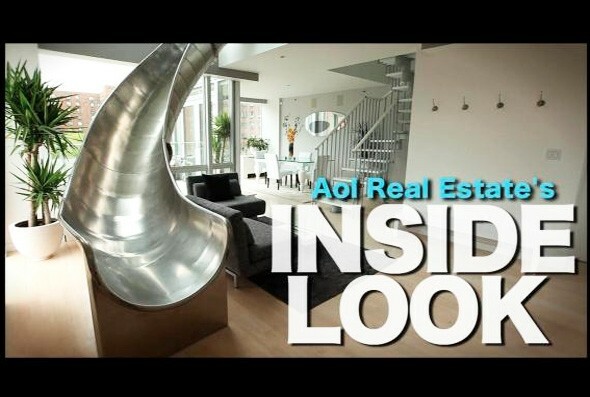 Follow AOL Real Estate reporters Krisanne Alcantara (@krisannetraz) and Teke Wiggin (@tkwiggin) on Twitter (@aolrealestate)! Spring buying season is here, and it may not have come at a better time for Americans thinking about taking the real estate plunge. Call us sanguine, but market bellwethers seem to suggest that housing's five-year descent has finally come to an end. With home affordability scraping record heights, now may be the best time to buy in decades, with one caveat: You should look at a home purchase the old-fashioned way -- as an investment in a living space, not a high-performing stock. Home prices are not going to rocket upward, as in the "steroid years." To celebrate the warm weather (and uptick in home construction and sales that usually accompany it), AOL Real Estate brings you homes on the market with some of the most mouth-watering outdoor entertaining spaces. Click through our galleries to see outdoor features of every stripe, ranging from free-form terraced pools to zen gardens. This waterfront mansion in woodsy Greenwich, Conn., is set on the much-coveted Long Island Sound waterfront. Behind its mogul-worthy exterior awaits some stunning outdoor space. See the listing for more details. Flanked by a luscious pool is a semi-enclosed patio, circled by by a stone wall, bushes and columns. The columns support a pergola laced with free-flowing vines. Taken with its otherwise-groomed features, the space offers a pitch-perfect blend of natural and man-made elements. This elegant villa sits behind gargoyle-lined walls, mixing "classic mediterranean architecture with Moorish flair." Amenities include a gourmet kitchen, media room, two-story office and exquisite murals. The luxury home is brimming with extravagant outdoor spaces, boasting eight open-air porches and patios that overlook a lagoon-like pool and the salty expanse beyond. The columned, curtain-draped cabana is "second to none," the listing says. It presides over a waterfall, spa, water slide, lounging area and the next logical conclusion for such lavish space: a stage for live entertainment. Florida has more that its share of luxurious "outdoor rooms" and spaces, and this 8,100-square-foot, palm-guarded mansion is among the best. For the deep-pocketed buyer, it also doesn't hurt that home prices, on average, have fallen 50 percent from their housing-boom peak. In addition to a wide range of amenities and finishes, the home features a roofed, outdoor kitchen that hugs the home's rear, and overlooks an intoxicating series of pools. The home's series of pools, at different depths, flow from one to the other. See the pools at the listing. This pueblo-style hacienda commands 14 acres, a generous portion of which are devoted to a stunning network of naturalistic pools. Described as a "free-form pool" in the listing, it includes tiered waterfalls and a hot tub, surrounded by benches and exquisite landscaping. The home's covered porch overlooks a vast New Mexico landscape, including views of five mountain ranges. A classic stone and brick home in the historic town of Chattanooga. Great for a large family, it has a master suite featuring a private sitting room, three large bedrooms that share a room with a fireplace and bathroom, and a guest room on each floor. Outside, you’ll find a large yard, porches and stone patio with a fire pit. Its interior, with plenty of hardwood flooring and marble surfaces, gives the house a polished look that contrasts with the outdoor entertaining area's embrace of the elements. This custom-designed mansion stretches nearly 9,507 square feet, and offers verdant landscaping -- from a lush, sweeping lawn to mature, encircling trees. What sets this entertaining space apart is its nuanced approach to landscaping, which strikes the perfect balance between laissez faire and hands-on. Well-kept garden plots are set against a backdrop of bushy trees. The rich expanse is anchored by a minimalist pool. The home also features a wrap-around patio, fireplace and hot tub. Built in 2009, this solidly built luxury home delivers a lot of bang for its buck. Interior features include vaulted ceilings and doorways. There's elaborate stonework throughout. At its rear sits a large outdoor patio that stretches out from an open-air room. The paved expanse eventually reaches a hot tub. Encased in brick, stone and wood, the home's exquisite outdoor room features a kitchen and massive stone fireplace. Though modest compared to our other picks, this Spanish-style home, which has stood since 1931, makes creative use of its outdoor space. The home's tiled terrace features a lushly landscaped path, and overlooks a mix of California plant life. A "shade sail" adds some flair to the area, while providing refuge from the blazing San Diego sun. Shade sails are trending in the world of outdoor decor, architecture and home design website Houzz says. In addition to providing, er, shade, the furnishings "lend a strong, artful, sculptural look," shade designer Tres Jones tells Houzz. We couldn't put it better! This house is a water-lover’s dream; it's set right on Naples Bay, and has quick access to the Gulf. With a private boatlift and dock, a quick trip out to sea is only minutes away. The castle-like home has an outdoor kitchen, a large pool and a hot tub, all with pristine views of the bay. Inside you’ll find lots of marble throughout the large hallways and open spaces, and a place to dine for any occasion. There’s a breakfast bar, breakfast room and a formal dining room. This Texas mansion features exquisite landscaping and an outdoor pool that is surrounded by fragrant Asian plants, including a Chinese fringe tree, olive shrubs, and white star jasmine. Ivy weaves its way through the home's columned pergola. The carefully landscaped exterior features a zen garden with a remote-controlled mosquito system, "which sprays a natural chrysanthemum repellant."